Do you know of the most nutrient rich tree in the world that grows really fast,its root,bark,leaves,flowers and pods can cure more than 300 diseases (according to Ayurveda),whose leaves,flowers and pods are edibles and are used to conjure up culinary delicacies, and can even purify water–but has been overlooked by modern medicine?Yes,we are talking about the Moringa or “drumstick” tree (moringa oleifera) an “all-natural multi-vitaminâ€ and a natural energy booster and its leaves contain high amounts of Vitamin A (four times more than carrots), Vitamin C (seven times more than oranges), protein (twice that of milk), iron(three times the iron of spinach) calcium (four times more than milk) and potassium (triple the amount in bananas) and are low in fat and carbohydrates.The leaves and pods are highly effective in preventing/reversing vision related problems and respiratory ailments, especially in children.The juice from the moringa leaves is believed to stabilize blood pressure, the flowers are used to cure inflammations, the pods are used for joint pain, the roots are used to treat rheumatism, and the bark can be chewed as a digestive and the gum that exudes from the stem is used to treat headaches.It is antibacterial, stimulant, anti-epileptic rubrifacient, carminative, stomachic, abortif, cardiotonic, antispasmodic, anti-flatulent and antiparalytic and and a good cleanser. 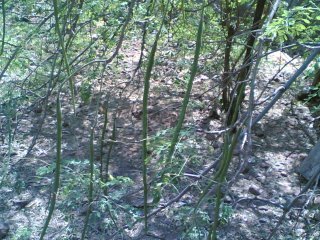 The Moringa or Horseradish tree(aka Munaga,Muruggai,Muranka) is perennial, erect, slender, medium-sized with many arching branches. It has drumstick-like fruits, small white flowers and small and tear drop shaped round leaves which are cooked and eaten as vegetable.There are a number of preparations made from moringa trees and exported from India,namely fresh drumstick fruit,Drumstick powder,Moringa oil,Moringa seed,Moringa leaf powder,Moringa leaf,Moringa pickle,Moringa tea powder,Moringa fruit powder,Moringa seed kernel,Moringa cake powder and Moringa root and many more.Powder from seed kernels works as a natural coagulant which can purify very turbid water removing up to 99 per cent bacteria. Pleasant tasting oilwhich is extracted from its seeds is used in preparing perfumes and lubricants.The seed cake is a protein rich plant fertiliser. 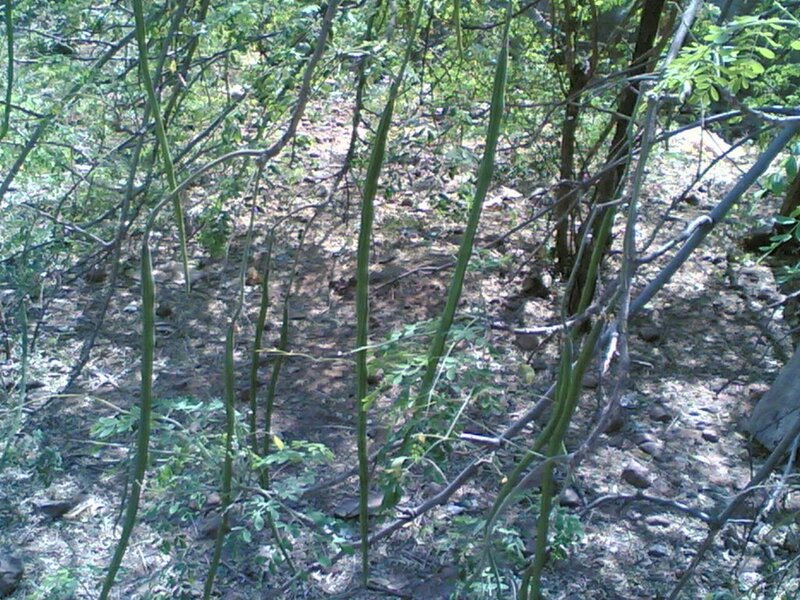 The gum obtained from the tree is used in calico printing and in making certain condiments while the bark of the moringa tree is beaten into fibres to make ropes and mats.You can see how each and every part of this remarkable tree benefits mankind. The miracle Moringa tree adorns our backyard and during season yields atleast 300 drumsticks (munaga kaadalu/kaayalu)with amma distributing them to our neighbours,friends and relatives.I decided to blog about this remarkable tree for this Weekend Herb Blogging started by Kalyn.The Moringa has over the years become an integral part of our daily diet.There is something special about these tender green leaves which you can use in your salad,prepare a soup or with dal or use them as a stuffing for paranthas.I use these leaves like spinach to make cutlets and is goes great with masala chai. I had earlier posted Drumstick Shrimp Curry and now I am sharing with you a soup dish called Munaga Aaku Charu or Drumstick Leaves Soup. Project Moringa of ‘Trees for Life’, a non-profit organization among other things is trying to popularize moringa leaves in Africa & India as an antidote to malnutrition.Let’s spread the word about ‘Trees for Life’ and Project Moringa and help make a difference to people’s lives. Heat 1 tbsp oil in a vessel.Add the mustard seeds and let them splutter.Add the red chillis,urad dal,methi seeds,garlic and cumin seeds and fry till brown. Add the onions and green chillis and stir fry for a minutes.Add the tomatoes,turmeric pwd,tamarind water,salt,curry leaves,jaggery and the drumstick leaves and let it boil.Once it comes to a boil simmer the soup for 5 minutes till the rawness of tamarind disappears.Adjust salt and turn off heat. Have it hot as a soup or serve with hot steamed rice. This is wonderful. Your posts are amazingly informative. I also love learning about the Trees for Life profit. I’m going to include it in the recap too. I’ve said it before but I’ll say it again. I love your blog. I always learn new things here. I love drumstick since my first encounter with it a few years ago but have been too afraid to try it. I’m really fascinated by this plant now. I think your project rocks. Hey Sailu, I never knew one could cook up a soup with munaga aaku. Sounds very interesting. I will try ! I tried your stuffed vankai koora and it came out to be fabulous ! Great recipes, applause !! This is so informative. I’m taking notes and will try to find drumstick tree leaves in Little India. Thanks for teaching us something new almost everyday. Thanks,Kalyn,for hosting a great theme and helping us all learn so many new things each weeknend. Thanks,MM.You should try this veggie for sure. I hope you find them in Little India,Zoubida.Your most welcome,Zoubida. Drumstick pappucharu is one of my favorite recipe. Simple to make yet so tasty. Good Recipe! Oh boy, this is one of my favorite we call it “Malunggay” in the Philippine and I’ve been looking around over here in my place but I couldn’t find one well yeah there’s a frozen one but I still like the fresh taken from the tree and have you try it’s fruits – can’t remember what we call it but they are delicious too and healthy! hmmm…thats a very good information. Must find out the name in Malaysia. EVen as a Chinese, i used Neem for certain ayurveda stuff. Very bitter but as the Chinese says, the more bitter the medicine, the faste it will cure. Thanx lots for the info. Sailu, A very healthy soup! A very informative post Sailu. Thanks for telling us about the project. And your vessel is sooo cute! Yes,Indira,a very simple and tasty recipe. Oh,Tin,my intention was not to make you homesick..:(Fresh is always the best anyday. I love srumstick leaves..my mom used to make it with shredded coconut. I think I will try the drumstick shrimp curry. You have been busy! I haven’t been for a while… sorry! Looks great! So, I must ask – where did you get that pot the soup is in? It’s so cute. I really want one! 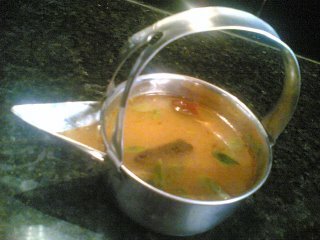 danielle,its a pot my mom gave me..:).Its a traditional stainless steel vessel and it comes with a strainer. Came across this site quite accidently, and you got to believe me when I say that I fell in love with it the moment I saw it, the pictures that go with each recipe are awesome and I am actually inspired to cook better for my would-be as mouthwatering as they look in the snaps. Thanks a ton for putting up such a wonderful site. This is too good, am going to refer to this to all my gang. You have given good source of knowledge. Thakt for puting your efforts. 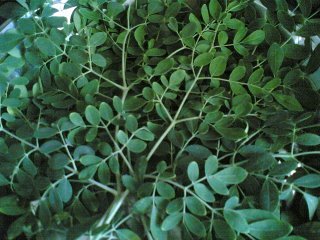 yes i agreed that moringa is really good to your health..i haven’t tried making soup of maluggay.i think it taste good.anyway, is it safe to drink a moringa shake? I’m a starter and your posts helped my cooking at Singapore..
can u post the drumstick leaves dal recipe also whenever u can. I would love to see how u make it.